We had another cold and rainy day here in Oregon. After being away in Idaho all weekend long, and eating every meal from restaurants, I was ready for a comforting home cooked meal. 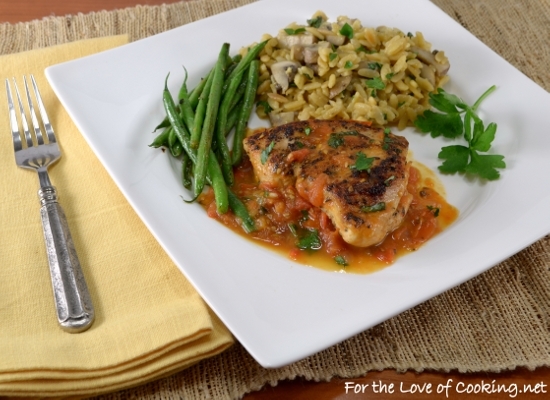 I paired this chicken with a side dish of orzo with garlicky mushrooms, parmesan, and basil and roasted green beans. The tomato basil sauce in this recipe is simple yet full of flavor and the chicken was tender, juicy, and tasty. This chicken turned out so delicious and flavorful. It’s easy enough to be a weeknight meal and it’s nice enough to be served to dinner guests. 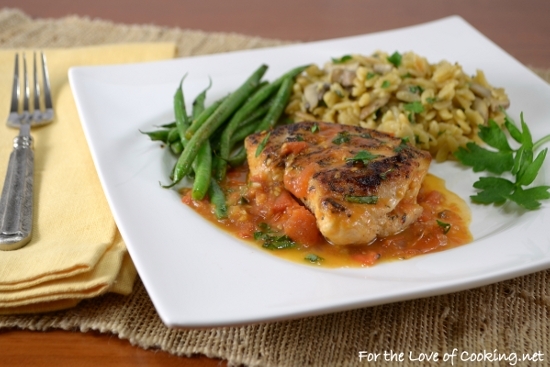 This basil garlic chicken breast with tomato basil sauce will be on my dinner table again… soon. I was lucky enough to recently receive an All-Clad NS1 Nonstick Induction Chef’s Pan, from All-Clad which is exclusively sold at Williams Sonoma, and I am absolutely in LOVE with it. This pan is not only beautiful it’s a dream to cook with. The nonstick induction chef’s pan sears and browns ingredients beautifully, which creates rich flavor and perfect caramelization. The chicken in this recipe turned out perfectly browned without using a ton of oil because of this pan. I also like that it is deep enough to make a nice sauce without worrying about it spilling over. When using the lid, the pan is perfect for braising and simmering. I have a feeling this will be my go to pan from now on. I am very happy to say that the generous folks at All-Clad are offering one of my readers a pan of their very own! See below for details to enter the giveaway. 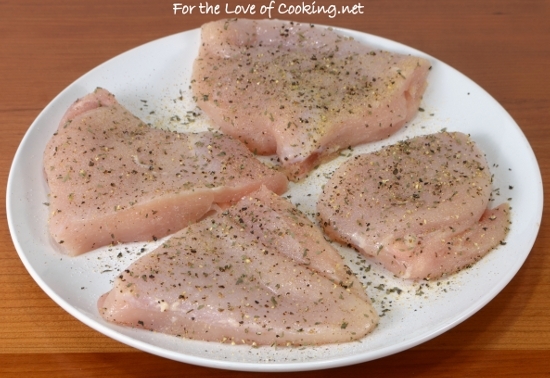 Cut the chicken breasts in half then place in between two sheets of plastic wrap. Use a mallet to pound the chicken pieces until 1/2 inch thick. Heat pan over medium-high heat. Add 2 teaspoons oil to pan. Season both sides of the chicken pieces with dried basil, garlic powder, sea salt, and freshly cracked pepper, to taste. Place into the hot pan, and cook until golden brown, about 4-5 minutes. Flip the chicken over and continue to cook, until the chicken is cooked through, about 3-4 minutes. Remove from the pan and place on a plate then cover with a tin foil tent. 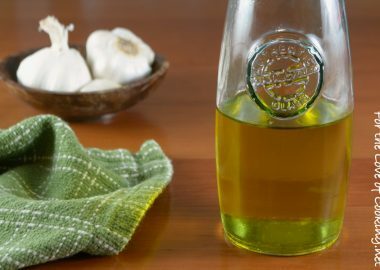 Reduce the heat to medium and add the remaining teaspoon of oil to the pan. Add the finely diced onion and a pinch of crushed red pepper flakes, to taste. Cook, stirring often, for 2 minutes. Add the garlic and cook, stirring constantly, for 1 minute. Add the diced tomato and cook, stirring occasionally, for 15-20 minutes. Add the butter and stir until thoroughly melted and combined. Taste and season with sea salt and freshly cracked pepper, to taste. Add the fresh basil and the chicken (along with their juices) back to the pan. Coat the chicken with the sauce and simmer until the chicken is warmed through. Serve each piece of chicken with sauce spooned on top. Serve immediately and enjoy. The generous folks at All-Clad are offering one of my readers their very own All-Clad NS1 Nonstick Induction Chef’s Pan valued at $99.95! Below are a few of this pan’s great qualities. All-Clad NS1 high-performance cookware combines the impressive heating abilities of anodized aluminum, a rugged three-layer PFOA-free nonstick interior and induction-compatible steel bases—plus it’s dishwasher safe. This chef’s pan’s flared silhouette, high sides and broad cooking surface make it the perfect candidate for one-meals and everyday sautéing, frying, simmering and steaming. Use the lid to retain moisture during cooking and keep foods warm until serving. 12″ diam., 4 1/2″ high. Durable hard-anodized aluminum provides rapid heat conduction with precise temperature control. Bonded three-layer nonstick system delivers unparalleled release, scratch-resistance and durability. PFOA-free nonstick coating is ideal for healthy, low-fat cooking with easy cleanup. Sturdy stainless-steel base prevents cookware from warping, protects stovetops from scratches and ensures compatibility with induction ranges. Tight-fitting stainless-steel lid helps circulate heat and moisture. Flared rim facilitates precise, drip-free pouring. To enter this giveaway simply leave a comment and tell me what’s the first thing you will cook with your new chef’s pan. Comments will close at 11:59 pm pacific time on Monday, November 16, 2015. Winner will be chosen at random and will be posted to the blog on Tuesday, November 17, 2015. Giveaway open to United States residents only. Be sure to include an e-mail address with your comment. A winner will be chosen randomly and announced on Tuesday night. I will email the winner and if the winner does not respond within 48 hours, a new winner will be chosen. Product will be shipped directly to the winner by All-Clad. Disclosure: All-Clad sent me this All-Clad NS1 Nonstick Induction Chef’s Pan pictured above and they have provided another pan for this giveaway, at no cost to me. For more about these wonderful pans, follow All-Clad and Williams-Sonoma on social media. I would love to make a sweet potato hash in this pan. Thank you for the chance to win! I’d like to make a cheese crust pizza in the pan. I saw a cheese crust pizza on Closet Cooking (a blog I visited years ago thanks to you, Pam). Your chicken looks divine. And lovely plating, as usual! My favorite pan is an All Clad pan but it isn’t non stick. I would love this! The first thing I would make is hashbrowns. The chicken looks so perfect cooking in that pan! I am obsessed with all my All-Clad and the non-stick is the best. I had no idea Williams-Sonoma had an exclusive pan! I think this looks perfect for stirfry! I would cook a veggie/chicken stir fry. Thanks for the chance to win! I would cook your basil garlic chicken – it looks great! I’d cook an omelet for brunch! Please enter me in the give away. The chicken looks relish! I think my first meal would have to be farm fresh eggs fried up with hash browns. Good looking dish Pam and we have a couple of breasts in need of a recipe. I’d have to give it a try with eggs – most likely an omelet. Fresh Tomato and basil pasta sauce. So yum! Well, of course your basil garlic chicken with the tomato basil sauce! It looks delish! I make my younger son an egg sandwich almost every school morning, so probably the eggs for his breakfast. your meal looks delicious ! 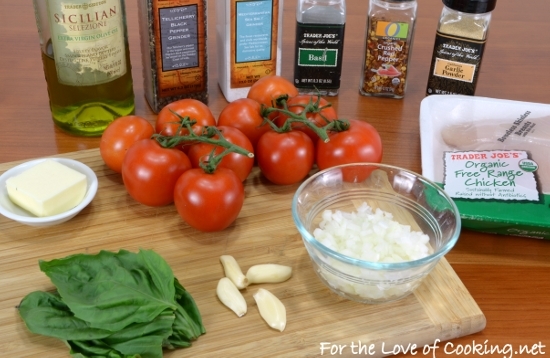 I would love to make the BASIL GARLIC CHICKEN BREASTS WITH A TOMATO BASIL SAUCE recipe above. It sounds so good. My son loves stuff like this. Your recipe looks so good. I’ve got to try it. I would make Pacific Rim Stir-Fry in my new pan if I won it. That looks like a fabulous pan! I’d probably make a risotto, or a chicken or pork dish with a pan sauce. Yum! I would make some fried fish! 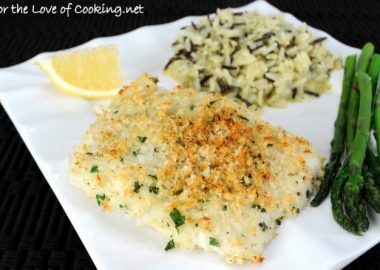 It’s an easy weeknight meal! What a great pan and the perfect opportunity for me to make some delicious Chicken Piccata in it! Would love to win this pan and finally cook a perfect omelet! I’d cook chicken piccata! (or however it’s spelled….) I might try a variation of your chicken tonight, with the chicken legs I have on hand, because it’s cold and rainy here again….while my roof is open to the sky. Your pan is beautiful, Pam, and I”d love to have it. I would love this pan. The first thing I’d cook is your chicken mushroom orzo recipe – it’s one of our favorites and in regular rotation at our house! I would make a panfried dish – either chicken or pork – to serve as a sandwich. It’s cloudy and rainy over here too. This looks so delicious! I want to make this chicken basil dish!!! I would make chicken stir fry first!! I recently purchased my first piece of All-Clad cookware and love it! Would love to add this non-stick to my new collection. First dish I’d make is a Shrimp scampi w/ fresh NC shrimp and herbs from my garden. I will most definitely make your Basil Garlic Chicken in Tomato Sauce. Looks and sound terrific! I can’t wait! I’d love to win the All-Clad pan. We eat a lot of chicken stir fry which would probably be my first dish in the All-Clad pan. I would make my WORLD FAMOUS : ) blueberry buttermilk pancakes! I bet they would come out even more delicious! Can’t wait! Now that it’s getting cooler, it’s time to make my mom’s stuffed cabbage recipe passed down from her mom. 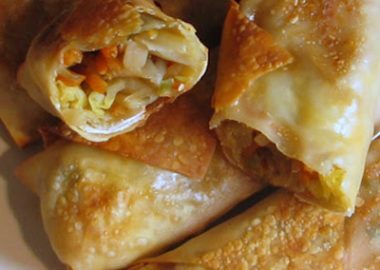 How great it would be to make them in a pan where they won’t get burnt! I would make chicken with potatoes, onions and bell peppers! I would make some kind of yummy pasta dish with garlic, onions, spinach, bacon, olive oil, green olives, salt, pepper, italian sausage, a little parmesan cheese, a little ricotta and a sprinkling of feta cheese. I would love this pan! I would definitely try your basil garlic chicken breasts first. They sound delicious with the sauce. OMG! I love that pan. I have an induction cooktop which I love. I think it’s the greatest. That pan would compliment it perfectly. Please consider me in the “give away”. The first thing I would cook is the recipe I just received – Basil-garlic-chicken-breasts-with-a-tomato-basil-sauce which looks scrumptious. I look forward to the daily recipes from For the Love Of Cooking. Great stuff! I would use this pan to put a perfect sear on a steak then finish it in the oven. This looks delicious. Perhaps it will be on the menu for next week. I was just at the brand new Williams-Sonoma Outlet store in Jeffersonville, Ohio yesterday! That pan looks lovely! I would love to win it. I think I’d make a sausage-egg and cheese scramble! I would make Chicken Piccata! Thanks for offering this giveaway! If i was lucky enough to win this pan… I would make a pecan crusted chicken breast. Just came back from New Orleans and loved this chicken. I told my friends I was going to make this when I got back to Montana. This pan will ensure a perfect chicken dish!! Thank you! What a great sauce. I bet the chicken was delicious. I would love to make egg in a hole for my youngest boys breakfast if I won! I would make some meatballs! Your recipe looks delicious and the pan is beautiful. I am on an egg kick right now, so I would probably make a frittata or an omelet first! 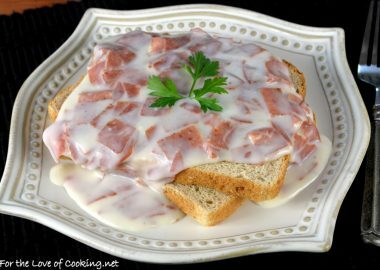 The first thing I would cook with an All Clad pan is this recipe! Yum! Thanks for sharing a way to jazz up chicken a bit in this house. Chicken Picatta is my go-to quick weeknight “fancy” meal. I love to use that when I ask impromptu guests for weeknight dinner in particular. The chefs pan is so versatile, however. It would become an essential part of anyone’s kitchen tools. Steak in butter. I can just see it coming to that perfect color as I render the fat. I would make pancit or corned beef hash first. Looking at those beautiful tomatoes makes me want to make some spaghetti and meatballs, so the first thing I would make is homemade meatballs and tomato sauce!!! The first meal I would make is probably tacos! My comfort food! What a gorgeous pan! I can see my green chili chicken pasta cooking in it right now! This sounds like a perfect pan for some pan-fried fish. Right now all i can think about is breakfast – so maybe a fritata with whatever left over veggies i have. Sweet potato and bacon hash. I love that it comes with a lid! I would fry an egg, cause that’s how you know how great a pan is. Scrambled eggs for my toddler! I’ve been wanting to cook Chicken Piccata. This looks like a great pan for that. I love, love, love my conduction cooktop. Dad lives with me and we’re big fans of sauces, so pasta sauce would definitely be my first in this all-clad cookware. I would make Pork Chop Marsala. Would Iove to cook for my family in this pan! I would like to say it would be something fancy, but more likely than not it would be pancakes or French toast at my house! I have 2 carb-loving little people that go through bread like it’s their job! 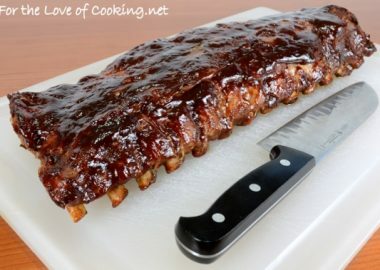 Bookmarked the recipe to make this weekend! Looks delicious. First thing I’d make is probably this dish! I would make a stir fry with curry sauce. If I won this wonderful pan, there are so many things I’d love to cook but I would probably start off with a nice paella! What a great pan. The first thing I would cook would be some nice piece of fish from the market down the street. I would season it with porcini powder and get a nice delicate crust on it. I would then carefully remove the fish from the pan and throw in some green onions and pickled onions along with some reduced chicken stock for a nice sauce to rest the fish on. We would cook a family favorite: Tempeh and Potato Ragout. 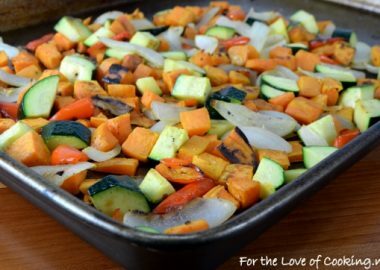 Stir fry with lots of veggies – yum! I have been eyeing a pan exactly like this for years… thank you for the chance!! The first thing I would cook is sautéed sweet potatoes with bacon and onion ! That looks like a perfect pan to do some delicious veggies – lightly seared – with a sprinkle of sea salt and a squeeze of lemon. I would put a few teaspoons of olive oil, followed by paprika, garlic powder, red pepper powder, and black pepper, two diced tomatoes, red bell peppers and diced chicken. Awesome fajitas! I would use this All Clad Pan every single day. First meal i would make is a delicious chicken vegetable stir-fry dinner or try one of your delicious recipes. Looks yummy! Can’t wait to try this recipe! 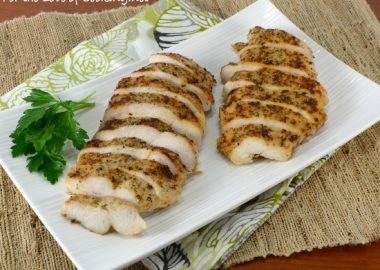 I would make this recipe (basil garlic chicken)! I have always dreamed of owning a All-Clad pan. The first thing I would do is saute onions, peppers and mushrooms and then cook my Denver omelet with lots of cheese, I love those suckers!!! Chicken Marsala. 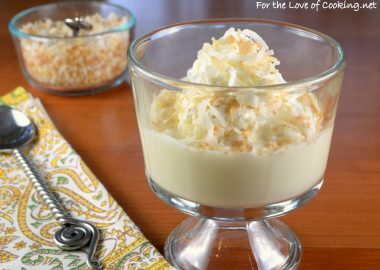 My husband really loves it and recently requested it for dinner. 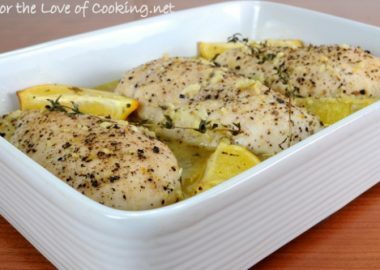 I would love to try making rosemary chicken breasts in sherry vinegar in this pan. It’s an old recipe I discovered years ago that’s perfect for a pan like that. I would cook curry chicken! It looks like a great stir fry pan! Looks delicious! Definitely trying this one! Thanks for the recipes! Anything and everything as my pots and pans are over 20 yrs old. I’d love to saute some onions and mushrooms in that pan! Yummy! Plenty of good things, cause the big day is right around the corner. But maybe something simple like scrambled eggs with cheese. Mine always sticks to my old pan. Jagerschnitzel with mushrooms! Beautiful pan!! 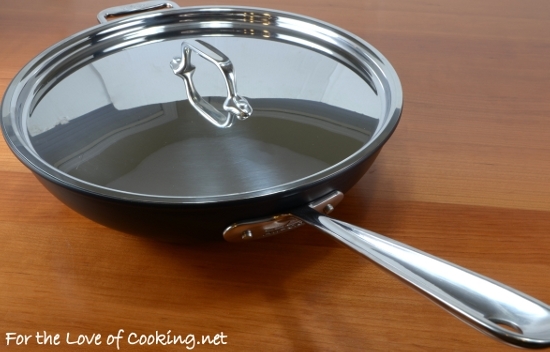 This pan would be perfect for my sautéed chicken breast with white wine sauce. I could also find many uses with Holidays coming soon. I will cook tofu Mongolian beef! 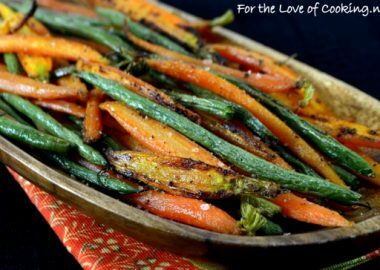 We have started eating veggie as a family, and this is a recipe I’ve wanted to try lately. I have never had a good quality pan such as All-Clad for cooking and think what a difference it would make in cooking dinners. The first thing I would make is Chicken Romano with a white wine caper sauce. looks like an awesome pan. there’s this butternut squash and parmesan risotto recipe i would like to try. yum yum! This pan looks perfect for making my Fettucine Alfredo topped with grilled Cajun Chicken breasts cut into strips. It is actually made with penne pasta, not fettucine. it looks large enough to make a serving for 4 to 5 people. I’m sorry, I misspelled fettucine. It is spelled fettuccine. I actually should try making it with your porcini mushroom powder to add another depth of flavor. LOL! Thank you so much for reposting the offer. I got so excited about the recipe that I forgot to enter! I would probably do chicken also, maybe chicken marsala or try a stir fry! I have the perfect recipe to use for this pan. It’s called always tender cube steak. The secret is that the cube steak along with onions, potatoes and carrots needs to be put in the oven to cook. The pans looks like it can be put in the oven with the glass lid and metal handle. Please pick me so I can make my family a one pot meal using this pan. Skillet a Chicken Burritos! Yum. I’d make a veggie stir fry! Yum 🙂 Thanks for the giveaway!! Oh, how I would love this pan! My most used pan is my nonstick skillet about this size and I’ve been looking to replace it, as it’s seen better days. 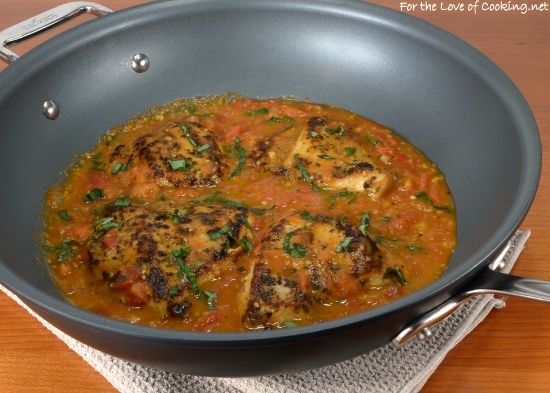 I think if I were lucky enough to win this pan, I would have to make this basil garlic chicken as my first recipe. Thanks for the great recipe, and for a chance to win this awesome pan! This pan would be a great one to have. I think I’d make pork chops as my first dish with it. Thanks for all your tasty creations… I enjoy getting inspired and trying new dishes through your dedicated passion for sharing. 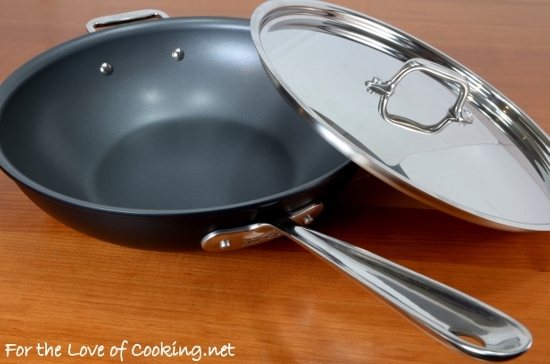 This looks like a great pan… you gotta love All-Clad! OMG, really nice nonstick pan, great size to use for so many foods. One recipe?? Hmm, Love to cook, saute” and one-pot meals for Hubby and I attempting to eat healthy and always trying new recipes then tweaking them. Love the site. 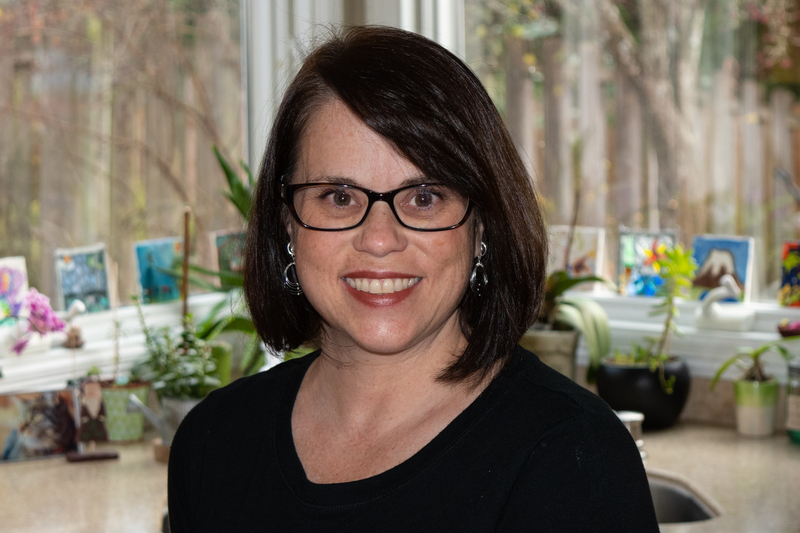 Please enter me for a chance to win in your special drawing. I love this dish and I love this pan. I have a similar one from All-Clad but it’s regular stove top, not induction. I just started using an induction burner at our BBQ contests now that we have a trailer and electricity. Might have to pick one of these up to use on that burner, right now I’m just using the three pots that came stock with it.